We were running round doing some errands last weekend and were a bit early for lunch so Welcome Cafe wasn’t open yet. My friend Mel had got takeaways from Mosaic by Simo a few weeks ago when she came to visit, and I couldn’t wait to go back. If you know the Addington area, its hidden in the little group of shops known as the Addingtown Mall. This is a little more “upmarket” than my usual takeaway choices. Mosaic by Simo is a deli, cafe and restaurant in one. They have both cabinet foods and cooked to order Moroccan dishes. 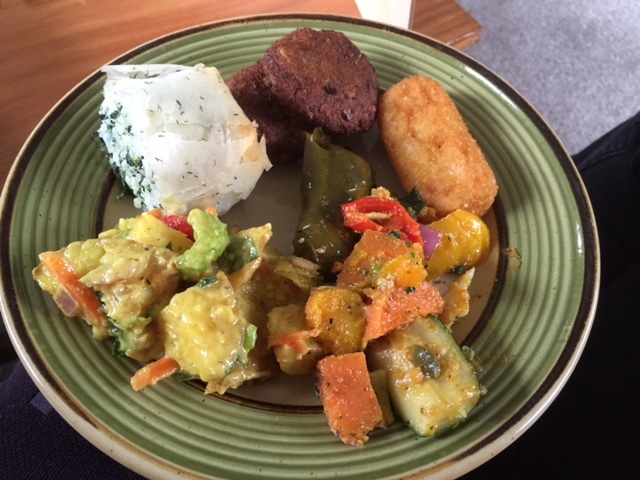 We just chose a selection of vegetarian items from the cabinet – falafel, potato croquettes, domades, spanakopita, potato salad and roast vegetable salad. These were priced anywhere from 3 for $5 for the likes of the croquettes and falafel to $7.50 for the salad pottles. Total was $42.50 and did 3 fairly large servings for lunch. Every single thing was absolutely delicious. I honestly couldn’t tell you which item I liked best. I’m keen to go back to dine in and try their targine dishes or wraps, and the desserts in the cabinet looked amazing! Would we come back here again? Yes definitely – its a bit out of our way, but if we were heading past, definitely we’d stop in. Would we try something else? Heck yes, if its this good all the time, its a real gem. Moroccan food isn’t your standard takeaway and the flavours were amazing! Is it better than Welcome Vegetarian Cafe (our baseline restaurant)? I’m so close to saying yes… its not as cheap though.